perfect for "Laundry Day" by the river! 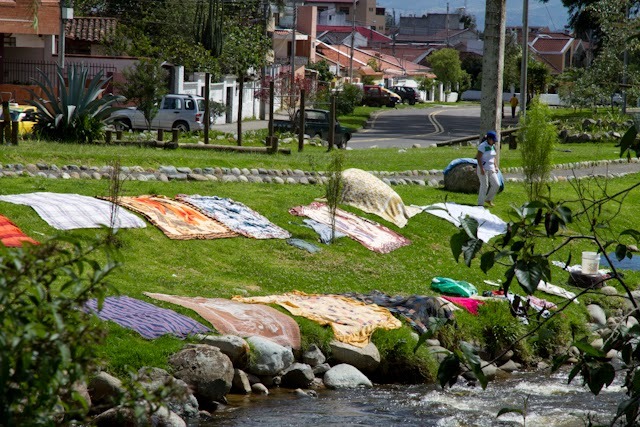 When we moved from our Oregon home to Cuenca, Ecuador, we left behind many things that I thought I would miss - like our washer and dryer. Our first four apartments were furnished, but only one of them had a washer and dryer, and we lived in that apartment only two weeks. 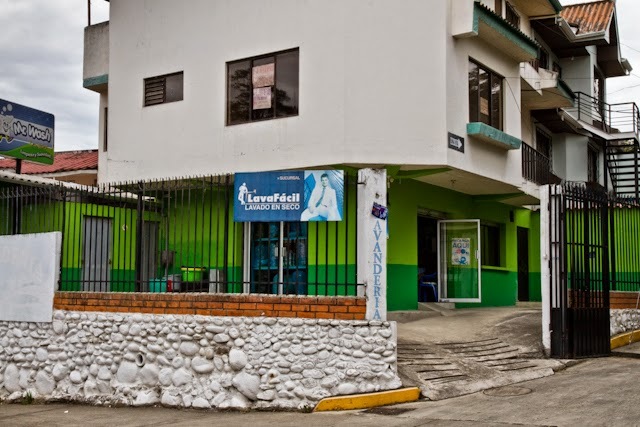 So, for the first year here, we would haul our laundry to one of the nearby local laundry services to wash, dry, and fold our clothes. Then, we would return to pick them up and haul them back to our apartment. These local places would staple little tags on every single piece of clothing with a 5 or 6 digit number handwritten on each tiny tag. I would then proceed to cut each little tag off every article of clothing before putting them away. Not fun! But, we had decided that we were not going to invest in a washer and dryer - and besides, where would we begin to fit them in our current small apartment? 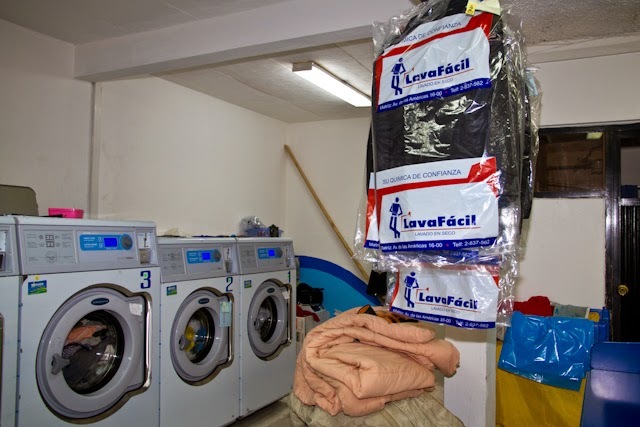 Laundry service here is so inexpensive, but I got tired of cutting the tags off every time we would have our laundry day. We also didn't enjoy hauling our clothes down four flights of stairs and to the laundry place. Nor did I like the fact that the reason they were tagging each item was because they would mix my clothes in with someone else's so they could make use of filling up their machines. However, I didn't want to find a self-service laundromat where I would have to sit there and wait for my clothes to wash, dry, and then have to take time to fold them. After all, I'm "jubilada" and doing laundry has never been a fun chore for me. Then, someone told me about MR. WASH! Really? They'll pick up our clothes, and deliver them - up four flights? They use organic products? They won't mix my clothes with any one else's? They have same day service? Count me in! I called them that day, and it was all true. They came to our apartment the next day, and delivered that night. No more little tags to cut off, and my clothes smelled so fresh and were folded so meticulously - I was now another one of their "happy" customers. Fabian and his wife, Inez, and their son, Kevin are great people. Their desire is to please their customers, and I'm thankful to know them and to be using their service. 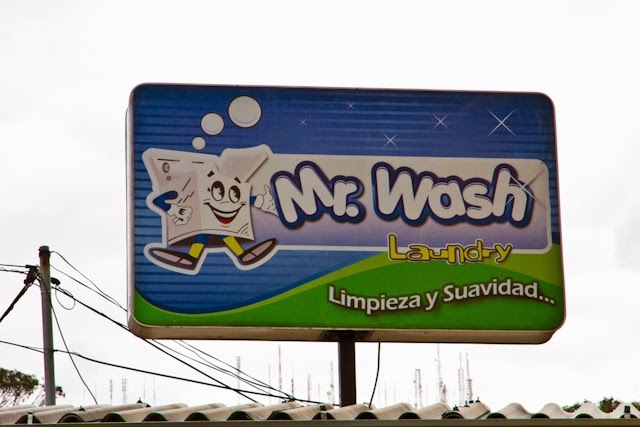 Another thing I love about living in Cuenca - I don't have to do laundry anymore!! Recently, I went over to Mr. Wash to see their facility and meet their staff. 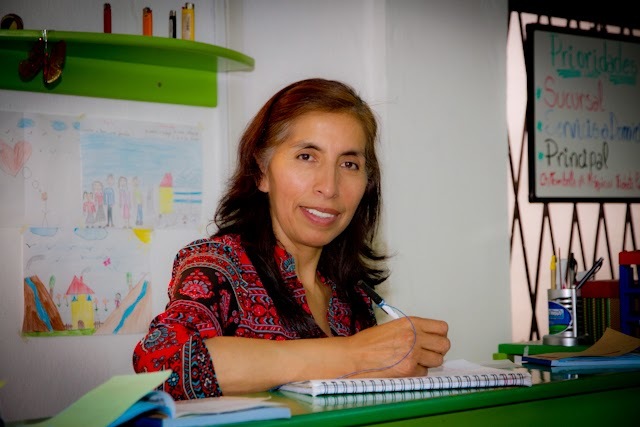 Address: Francisco Estrella entre Avenida 27 de Febrero y Avenida 10 de Augusto. Meet Inez (Fabian's wife and owners), Anita, and Estefania - hard-working women who take special care of their customer's laundry. MR. WASH is open Sunday through Friday from 7 am to 7 pm. They are closed on Saturdays. They've been in business four years and know how to take care of their customer's needs. The employees are meticulous about how they fold each item of laundry, and when they return them to us, nothing is ever missing. .........and dry cleaning service too! Oh, and they will hand-wash and line dry delicates! Did I mention that they also IRON your clothes upon request? Yes, MR WASH is a full-service facility that I highly recommend. 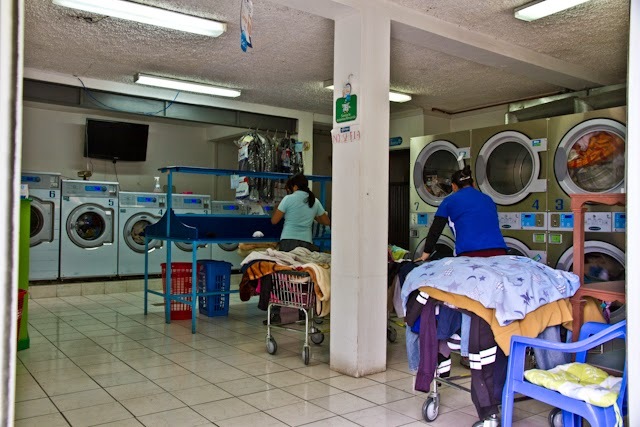 They are definitely meeting all of our laundry needs - and I'm thrilled that I can now wait up to three weeks for my pickup and not have to haul my heavy bags through the streets of El Centro. Recently, Bo spilled Coconut Oil on a pair of his new hiking pants. Here, Inez and her helper are looking at the stain and ready to take on the task of removing it. AND THEY DID! I've had other stained clothes that they always return to me spotless. Now, that's service at it's best!!! 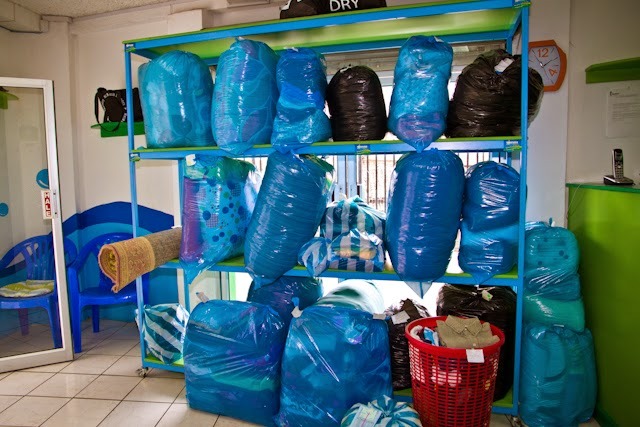 If you want your laundry picked up and delivered, and if you want organic products and fabulous service - give MR WASH a call at 099-055-2419. Inez will be over that day ($2-$4 delivery charge depending on where you live) to take care of your needs. Thank you, Inez, for giving me a tour of MR. WASH and for taking such good care of your customers! Bo and I appreciate your incredible laundry service and we're glad we found you!!! 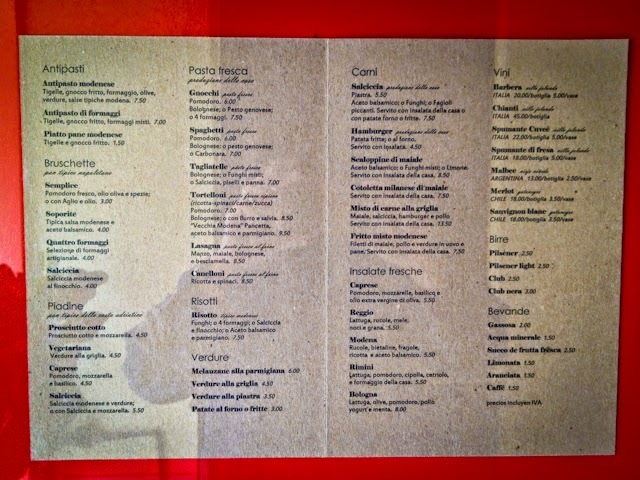 Restaurants in Cuenca, Ecuador - RESTORANTE VECCHIA MODENA - A "Don't Miss" Experience!! and it's right around the corner from us! He will be reopening SOON!!! If you've been to our place to eat, you know that Bo and I like to cook delicious gourmet foods. We also like to eat out, but not just anywhere. Sometimes friends or acquaintances will recommend a place to us. If we know they are excellent cooks, we'll trust their recommendation. Only then is it usually a hit! Those of you who are "great" cooks know what I'm talkin' about. You just can't eat any ol' place. It's gotta be GREAT! 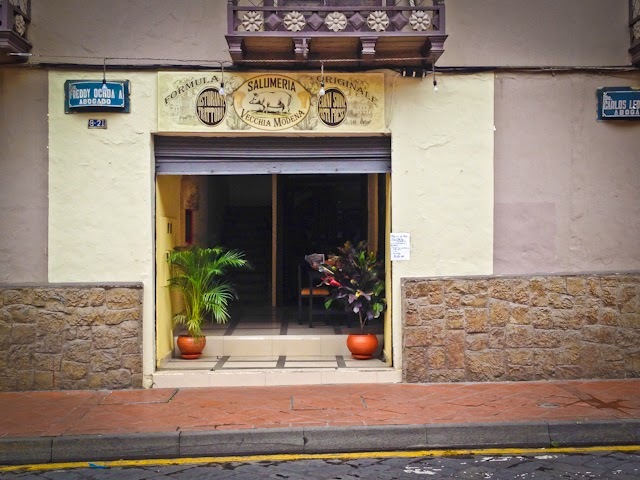 There are a million dining places to explore in Cuenca. Some have great atmospheres and not-so-good meals. Some have delicious food, but the place may not be quite on a par with cleanliness. I always check out the bathroom to see if it is an establishment that is paying attention to detail in the hygiene department. Then there are the places I've experienced where the food, service, atmosphere, and hygiene department are all a big "zero." Hey, you've experienced that too, haven't you? It's a place that you would NEVER recommend nor return to. Because we don't eat every meal or even half our meals outside of home, for us to dine out is to look for the package experience. 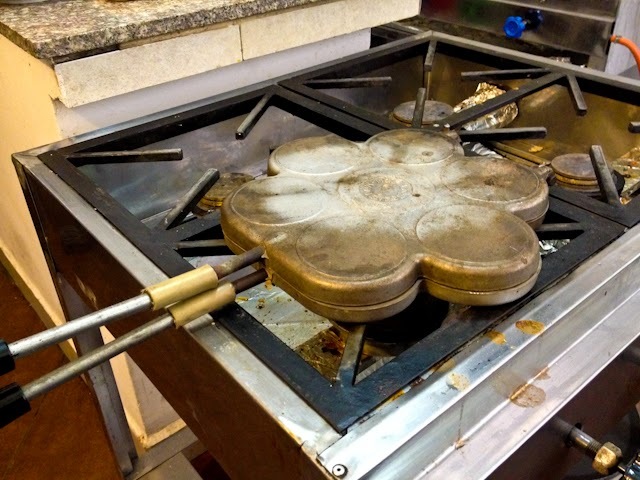 Great food, attentive service, classy atmosphere, and friendly personable owner and staff. 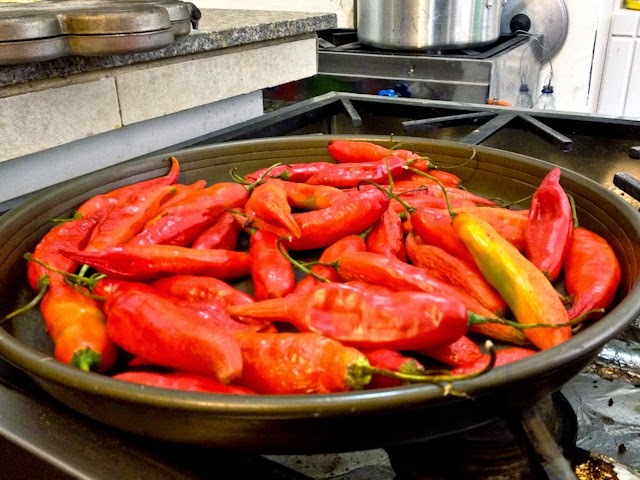 Living in the heart of El Centro gives us daily opportunities to peek in various restaurants as we walk the street and continue to get acquainted with our neighborhood. There are many popular restaurants that have closed in our almost two years here, yet new ones are always popping up and enticing us in. We'll usually go in to talk to the owner or staff, check out the menu for the type of cuisine and PRICES, scope out the atmosphere and look for cleanliness, and then make our decision whether we'll sit and order now or return at a later date to see what kind of dining experience we end up with. The other day, I dined with a friend at a local popular and often advertised restaurant in El Centro. I was eager to experience a new place for almuerzo. We entered a courtyard that was quaint and lovely, but the food prices high and portions surprisingly small. We both left hungry and disappointed. As for the service and customer care - I give it a big ZERO. Because the owner knew it was our first time experience (I told her so she could impress us), she FINALLY returned to ask us "how was it." In honesty, I complimented her that the food was good (between us - not great), but the portions extremely and surprisingly small. Her response? "Well, that's how we do it here," and she scurried away. Do ya think I'll go back there to eat? NOT! Bo had been telling me about a small new restaurant on Juan Jaramillo, right around the corner from our place where he had recently purchases some delicious cheeses and sausage, and where he also had lunch with friends. Yesterday was my time to experience "Ristorante Salumeria Vecchia Modena" - and our few hours dining there and getting to know the Chef and Owner, Massimo, his wife Alicia, and a visiting chef friend of theirs, Luca, was fun and a "delicious" experience. We had stopped in earlier for Bo to introduce me to Massimo, and we left with our purchase of three different Italian cheeses. I kept looking around and was impressed by the colorful and classy decor, I enjoyed seeing his tables full of ex-pats who had already discovered this quaint place (he's only been open a few months), and I quickly made a silent decision that I would be back with Bo in the very near future to enjoy some good wine and authentic Italian food. We continued on our way to do errands and visit friends in El Centro. Well, wouldn't you know - Bo left his umbrella at Massimo's - so we had to stop back in on the way home to pick it up. It was now early evening, and Bo asked me if I'd like to sit and have a glass of wine and a bite to eat. 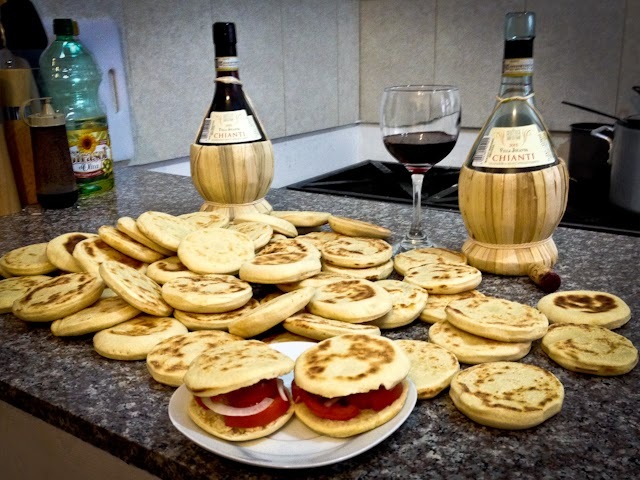 We sat and began to be pampered by Massimo as he poured two glasses of Chianti and served us delicious warm Tigelle bread baked fresh and filled with his creative concoction of Roma tomato, Italian cheese, sweet onion, and a "to die for" homemade sweet relish. 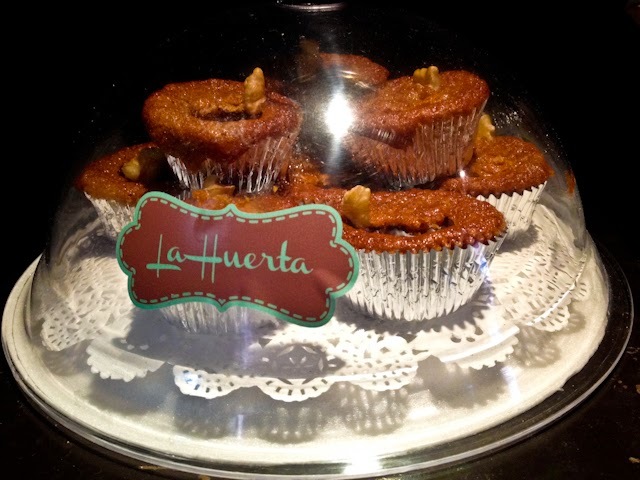 I could have eaten a dozen of these little treats, but I'm watching my girlish figure. 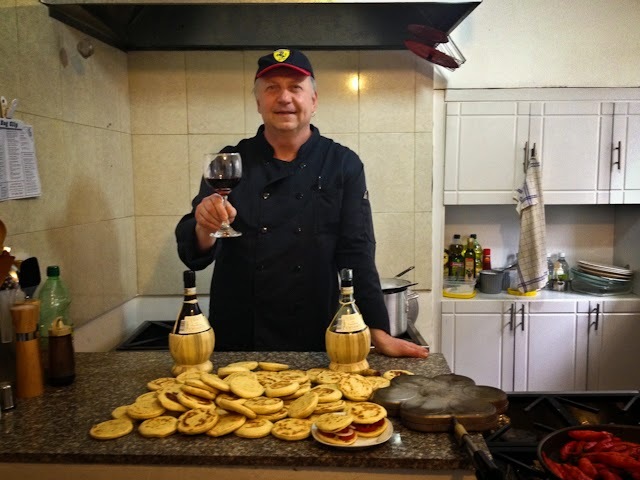 As Bo and I dined and sipped our fine dry Chianti, we learned all about how Massimo ended up in Cuenca, Ecuador to open his restaurant so he could share his savory Italian cuisine with those looking for an authentic Italian experience. We went home happy and full. Late in the evening Bo served me a bowl of his homemade White Bean Soup with savory chunks of real Italian Sausage (purchased earlier at Massimo's Restaurant). It was so delicious I almost had a second bowl. 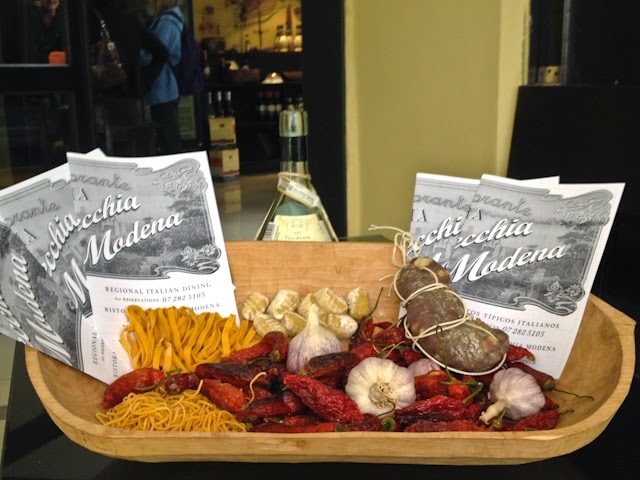 If you haven't been to Ristorante Vecchia Modena, you should! You will enjoy meeting this kind and smiling Chef and have a wonderful dining experience. Tell Chef Massimo that "Bo and Linda" sent you. You won't be disappointed. 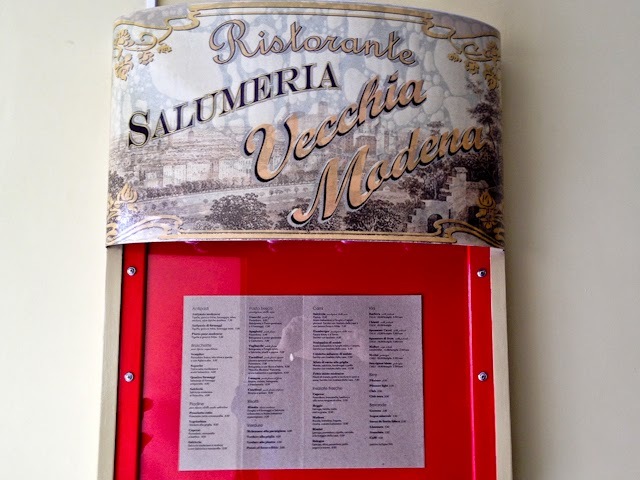 The minute I entered Ristorante Vecchia Modena I loved it. 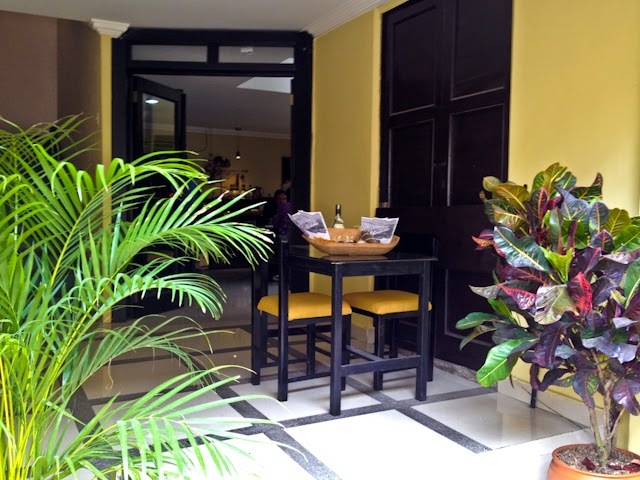 The vibrant colors, lush thriving plants, and classy atmosphere and decor wooed me in. Of course, the first thing I want to see is "what are they serving?" and "What are their prices?" 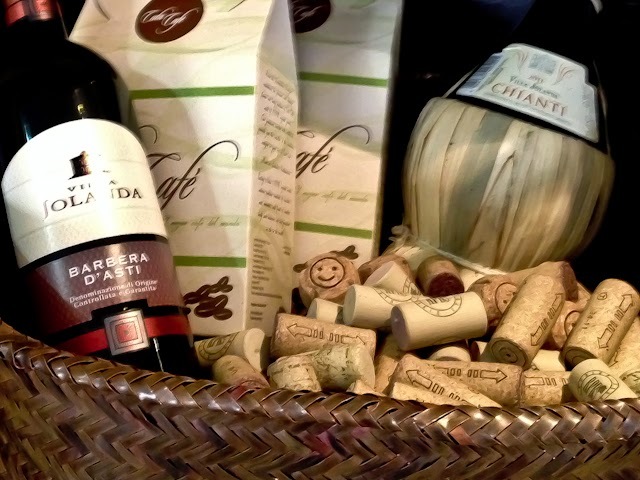 When it's a package deal I'm happy to pay - delicious food, friendly attentive service, classy atmosphere - and clean. 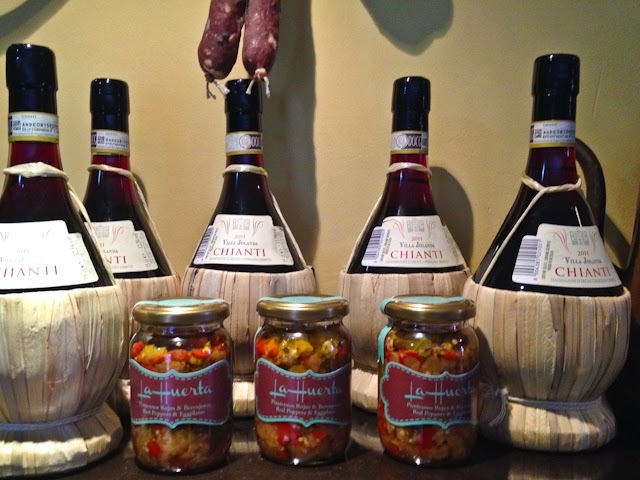 Massimo knows good wine and was running a special this weekend on his Chianti. 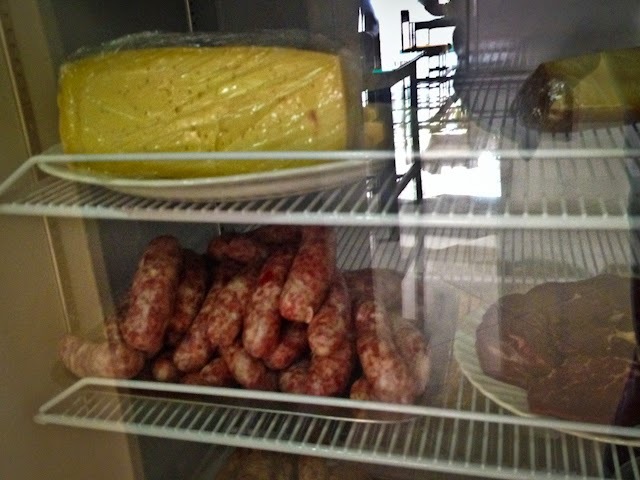 You can buy fine cheeses (Mozzarella, Parmigiano, Fontina, and Scamorza, Pecorino, Feta, Chevre, Cottage, and more), homemade Italian sausage, Salsa Picante (Relish), Italian Extra Virgin Olive Oil from Italy, and when excellent cuts are available - Lomo Fino (Tenderloin). Massimo purposes to sell only the finest! 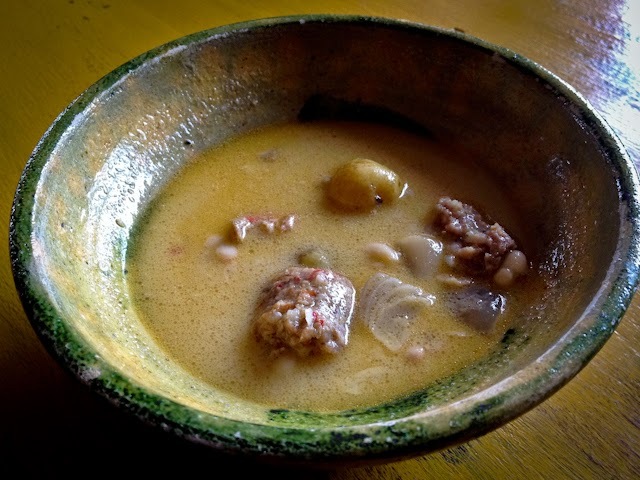 Ahhh, Bo's delicious White Bean & Sausage Soup. I must say, it's the best sausage I've had in a looooooong time - since we left the USA. 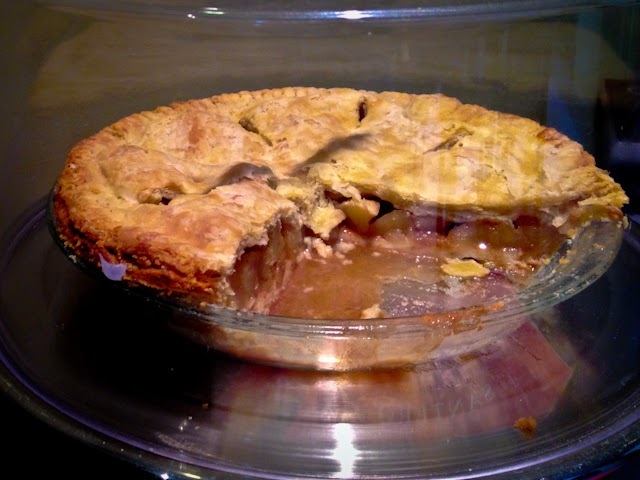 .......or homemade butter crust apple pie. He uses fresh ingredients and everything is cooked in his well-stocked kitchen. We had the privilege of going behind the curtain to see how he cooks some of his fabulous creations. 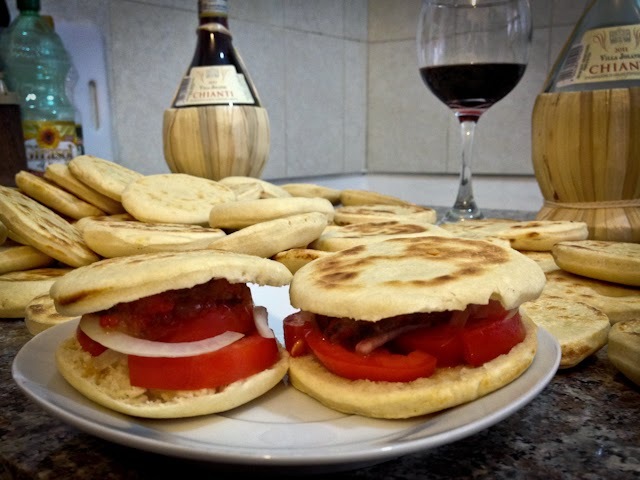 The Tigelle bread was freshly made, warm, soft, and filled with an amazing homemade relish spooned on top of sliced Roma Tomato, thinly sliced sweet onion, and an Aji Italian cheese. They were so amazingly delicious that Bo and I bought 30 of these little breads and all the inner ingredients to make these for a pot luck we would be attending the following evening. 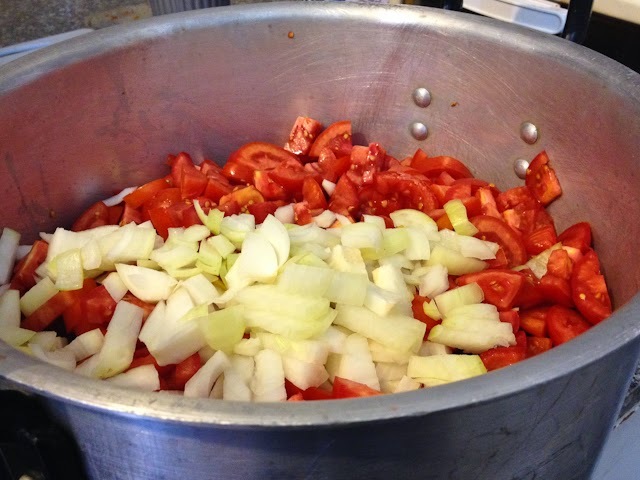 Ingredients are ready for a simmering homemade Italian sauce. and be ready for a memorable and delicious experience. Tell him that Bo and Linda's Blog post wooed you in!! !